Kia ora and haere mai, welcome to the eighth instalment of 9mm for 2018, and the 180th overall edition of our long-running author interview series! 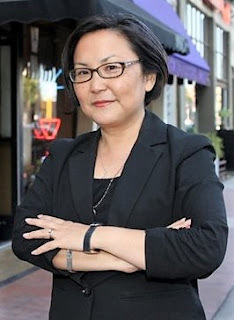 Today I'm very pleased to welcome Edgar Award-winning author Naomi Hirahara to Crime Watch. I first came across Hirahara's work a couple of years ago when I read SAYONARA SLAM, the sixth mystery in her series starring Mas Arai, an elderly Hiroshima survivor working as a gardener in Los Angeles and moonlighting as an unlikely amateur sleuth. Arai is a unique and unforgettable hero, who first appeared in SUMMER OF THE BIG BACHI (2004), Hirahara's debut novel after the former journalist had edited and written several non-fiction books focused on Asian-American figures (gardeners, strawberry farmers, business figures, doctors in wartime detention centres). Hirahara is herself the daughter of a Hiroshima survivor. Her maternal grandfather was killed by the nuclear blast. She was born in California and grew up in Pasadena, before studying international relations at Stanford University, Japanese Language Studies in Tokyo, and volunteering in Ghana. Earlier this month, the seventh and final Mas Arai tale, HIROSHIMA BOY, was published. In that book, the curmudgeonly octogenarian returns to Hiroshima to deliver his best friend's ashes, only to become entangled in the mysterious death of a teenager, a boy about the same age Mas was when he survived the nuclear bombing, many decades ago. Stubborn as always, he feels he can't return to California until he sees justice done. It will be interesting to see where Hirahara goes after this, if it really is goodbye to Mas Arai. She has also written a young adult drama and two other mystery novels featuring rookie LAPD bicycle cop Ellie Rush, who dreams of being a detective. But for now, Naomi Hirahara becomes the latest author to stare down the barrel of 9mm. COTTON IN MY SACK by Newbury Award winner Lois Lenski. Her depiction of a sense of place - Southern farms - as well as the hardscrabble lifestyle of a sharecropping family. Probably subconsciously I could relate to it as the daughter of a gardener! I recently went back to read Lenski's work and her stories are soaked in Southern dialect. (I don't think it could be published for children today.) It's no wonder I resonated with her work. Well, I was a journalist, off and on, for 10 years, so lots and lots of articles. I wrote quite a few short stories, pretty bad ones, that were published in the same ethnic newspaper. I'm a bit embarrassed by those efforts, but I also see that I was honing my craft. And by having them published, I felt like a real fiction writer. I enjoy cooking, eating street food, going to sporting events - mostly basketball and baseball games, reading (of course! ), travel to local history spots and gardens, and watching movies. My husband and I are movie fiends. We actually go to a movie theater once a week. Oh, I love taking daily walks with my dog, Tulo. I feel like I have two hometowns: Pasadena, California, and Little Tokyo in downtown Los Angeles. Pasadena: Take a hike in Eaton Canyon to a 40-foot waterfall. Little Tokyo: Visit the James Irvine Japanese-style garden on the basement level of the Japanese American Cultural and Community Garden. Green in the middle of concrete. Spiritually, James Cagney. More realistically, Kelly Marie Tran. Probably my first, SUMMER OF THE BIG BACHI. Took 15 years to conceive. Enough said. Happy dance, of course! We went to a fancy restaurant. I don't remember what we ate, but it was expensive. A man interrupting me and starting to talk about how the Japanese could kill you with one finger. It happened to be on Pearl Harbor Day, so I was a bit rattled inside. Later I realized that people said that about martial artist Bruce Lee. That wouldn't be a bad skill to have sometimes. Thank you Naomi. We appreciate you chatting to Crime Watch. 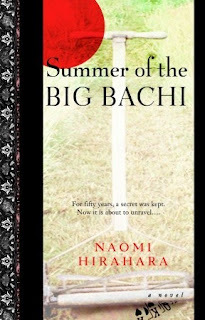 You can learn more about Naomi Hirahara and her Edgar-winning Mas Arai mysteries at her website, and follow her on Twitter.